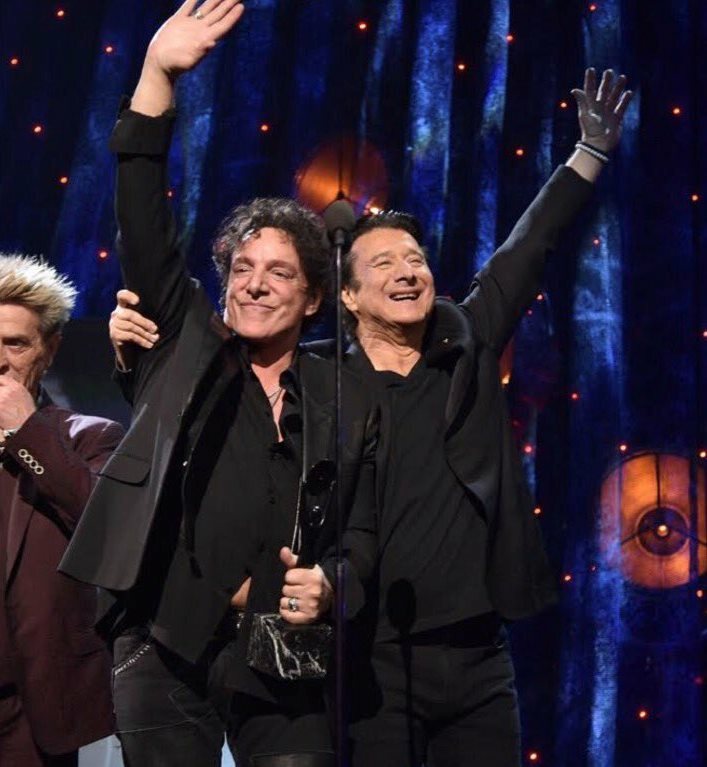 A big question hung over Journey as 2017 began: would former vocalist Steve Perry reunite and perform with them at their induction into the 2017 Rock And Roll Hall Of Fame in April? The classic Perry lineup of Journey – Neal Schon, Jonathan Cain, Steve Smith, Aynsley Dunbar and Ross Valory – were selected to enter the 2017 Rock Hall alongside founding keyboardist/singer Gregg Rolie. Journey had their most successful commercial period with Perry, who joined the group in 1977; a string of multi-platinum albums followed before his departure in 1998. The last time the singer performed with his former band was at a tribute show for legendary concert promoter Bill Graham following his passing in 1991. Confirmation of Perry’s status came during Journey’s spring North American tour, a little over a week before the induction event. Perry was on hand at New York’s Barclays Center on April 7 to join Journey for their induction, joining Pearl Jam, Yes, Electric Light Orchestra, Joan Baez and Tupac Shakur as part of the Class of 2017. As the band members delivered their acceptance speeches, the reclusive singer enthusiastically raved about the fan’s support, even after all his years away from the group. Journey returned to The Joint at Hard Rock Hotel & Casino Las Vegas for a nine-show residency entitled “Journey Las Vegas” in May before heading out on a summer US tour with Asia in June. In early June, Journey hit the headlines when Schon revealed some apparent dissention within the band during a series of social media posts directed towards keyboardist Cain. Schon got more specific with some follow-up comments (which were deleted), writing, “I’ve stated how I felt about mixing Religion and Politics and how our music is not of 1 religion – Democratic or Republican. This is and has been an issue with myself Mr Cain and his now wife since he married” – a reference to Cain’s wife, Pentecostal Christian televangelist Paula White. Pineda jumped into the fray to play peacekeeper between the two, and the group managed to finish their 2017 live schedule in July with an appearance at the Classic East festival in New York, where they playing as part of a weekend lineup that included The Eagles, Fleetwood Mac, Steely Dan, The Doobie Brothers and Earth, Wind & Fire. In December, Schon released his first-ever holiday EP; the four-song set includes "Ave Maria," "Can’t Help Falling In Love", and instrumental renditions of Journey hits "Open Arms" and "Faithfully." The guitarist also announced plans to perform a benefit concert for those affected by the wildfires sweeping across California. Dubbed "Neal Schon's Journey Through Time", the February 9 event at The Independent in San Francisco, CA will see the rocker joined by former Journey members Gregg Rolie on keyboards and drummer Deen Castronovo, as well as bassist Marco Mendoza and keyboardist John Varn.